About 85 percent of the farmers in India are marginal and small farmers. More than half of such farmers live in a resource constraint system with limited land availability, water scarcity and access to sources of energy. Bundelkhand is one such difficult terrain where farmers face approximately two droughts in five years. It is home to large number of farmer households who own two-three acres of land. Yatris visited Babina, Uttar Pradesh where they met farmers from “Sahariya Vikas Manch”. One of the farmers Bhagwan Dasji had sown Guava trees in the uneven land that was considered wasteland five years ago. The Guava trees have matured and provide secure income to around 30 such tribal farmers in this village as a result of the WADI initiatives. 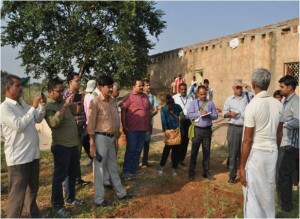 While media participants at the Yatra interviewed the farmers on their experiences to assess their prosperity before and after setting of WADI, resource persons from Government of Madhya Pradesh and agriculture experts pointed out concerns related to fencing and value addition of the mass Guava production from the area. Participants at the Yatra understood and emphasised the security of income and livelihood that a WADI model on wastelands provide to the farmers. WADI, if accompanied with appropriate watershed activities, fencing from stray animals to ensure proper functioning of the model, would enhance the income of small scale farmers. 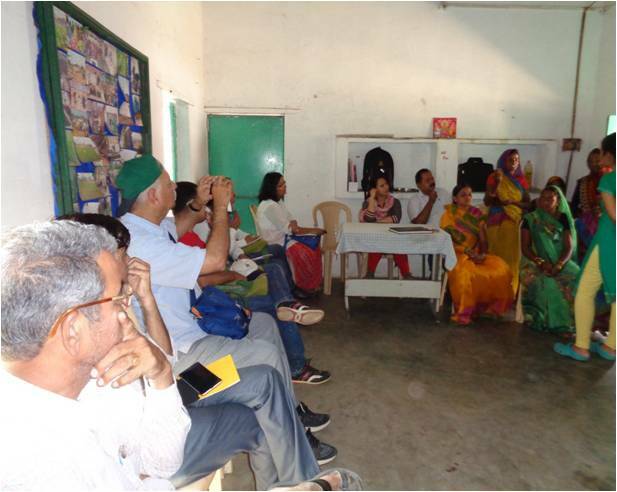 A quick brief on different interventions conducted by the Federation group at Gaushala, supported by Development Alternatives was oriented to all the TARAgram Yatra Participants. This was followed by discussion with women from the Federation and questions on profits and sustainability of these models were raised. The spice unit run by a women federation at Gaushala, Orchha, processes and packages locally produced spices like turmeric, coriander, etc. A vermi-composting unit, packages and sells vermin-compost to the local markets. Such value addition activities owned and run by local community women were collectively identified by the TARAgram Yatris as not only helpful but essential for empowerment of community, especially the women. Converting fresh spices into processed goods such that it increases the shelf life of the product places a huge impact on the bargaining power and regular supply of these spices to the market. As pointed out by the Yatris, source of energy in running the spice unit and drying spices was and is based on rural sources from Gobar gas to solar energy, which makes this initiative not just unique from environment perspective but also reduces the costs of production and processing. The TARAgram Yatra participants met the Watershed committee at Dhikoli village, Uttar Pradesh. This committee has extended its interventions from watershed to exploring diverse innovative agriculture techniques and practices. This village could be called as a ground where scientists and farmers are experimenting with their current knowledge and upcoming technologies. At one end, projects with support of ICRISAT, CAFRI, NABARD have experimented and piloted various technologies. For example a technology popularly liked by TARAgram Yatris was that of treatment of domestic waste water to make the water usable for irrigation purposes. While farmers have welcomed the use of new technologies associated with agriculture, they have also adopted certain technologies on their own, in accordance to the resource availability. Multi crop systems that are not just climate resilient but also select appropriate crop basket for minimizing risks from one crop failure can be seen in farmer initiatives at Dhikoli. 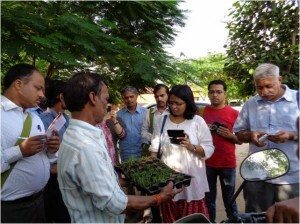 Such experiments by scientists and farmers on their farm highlight the potential of agriculture to explore new avenues and possibilities of sustainable agriculture. These farmers are indeed “model farmers” who have shown the strength in community based models and are willing to adopt existing technologies to ensure farmers’ and therefore food security.